Alekhine's death – an unresolved mystery? 3/25/2006 – In 1946 Alexander Alekhine, the fourth world champion, was penniless and ailing, ostracized by the chess community. Then, on March 23, the British Chess Federation informed him that preparations for a title match against Botvinnik were completed. The next day Alekhine was found lifeless in his hotel room. There are still questions about his death. First a word about the name. The Russian Алехин is pronounced ahl-YEKH-een (KH as in the Scottish "loch"), with a common variant ahl-YOKH-een which Alekhine himself did not like. In English the name is usually spelled Alekhine and pronounced AL-lek-kine. Alexander Alexandrovich Alekhine was born on November 1 (some sources give October 31), 1892, to a wealthy family in Moscow, Russia. His first notable chess accomplishment was winning the All-Russian Amateur Tournament in St. Petersburg in 1909, at the age of seventeen, with a score of twelve wins, two losses and two draws. In 1914, after finishing third behind Lasker and Capablanca in Saint Petersburg, Alekhine was named one of the five original "grandmasters" by Tsar Nicholas II. In 1921 he left Soviet Russia and moved to France, becoming a French citizen in 1925. He studied law at the Sorbonne, where he gained the title of Doctor. Alekhine's chess career is too long and spectacular to summarise here. In 1927 he won the world championship from Capablanca, whom he somewhat controversially avoided playing again, instead defeating compatriot Efim Bogoljubow twice and then losing the title to the Dutch mathematician Max Euwe in 1935. Alekhine won it back two years later, by a large margin, and retained it until his death in 1946. In the years before his death Alekhine lived in Spain and Portugal, playing tournaments in Nazi Germany or German occupied countries. He is also given as the author of a number of articles directed against Jewish chessplayers, which appeared in the Nazi press. After the war he denied being the author of these articles. During these years, the early forties, Alekhine was suffering from cirrhosis of the liver, duodenitis and sclerosis of the arteries. He had no proper income and lived from a pittance earned with chess. He was also severely depressed. In July 1944 Alekhine wrote to the journalist and chessplayer Juan Fernandez Rua: "The best part of my life has passed away between two world wars that have laid Europe waste. Both wars ruined me, with this difference: at the end of the first war I was 26 years of age, with an unbounded enthusiasm I no longer have. If, sometime, I write my memoirs – which is very possible – people will realize that chess has been a minor factor in my life. It gave me the opportunity to further an ambition and at the same time convince me of the futility of the ambition. Today, I continue to play chess because it occupies my mind and keeps me from brooding and remembering." In 1946 Alekhine was invited to play in a tournament in London, but under pressure from American players (Reuben Fine, Arnold Denker and others) because of his wartime record the invitation was withdrawn. He resumed negotiations with FIDE for a match against Botvinnik, which was to take place in England under the auspices of the British Chess Federation. The BCF confirmed that an agreement had been met and arrangements made in a telegram delivered to Alekhine on March 23, 1946. Alekhine was in a hotel in Estoril, Portugal. He was found dead in his room on the morning of March 24. The date of his death is usually given as March 25th, and this may be a result of assuming he had died on the previous evening. The date on his grave notes March 25 (see below). The cause of death given was either by his choking on a piece of meat or by a heart attack, though the exact circumstances remain to this day a matter of debate. 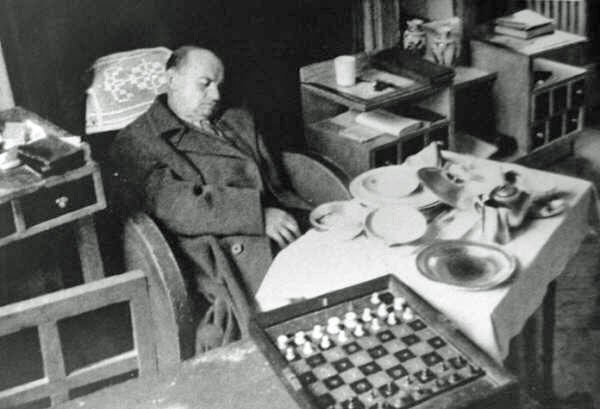 The above police photo shows the dead Alekhine, as he was found in his hotel room. The original image we obtained is larger and can be viewed by clicking the above image. It has been slightly enhanced in contrast but otherwise left untouched. AP reported at the time that Alekhine's body had been found by a waiter when he brought in breakfast. The waiter said that Alekhine was slumped at the table, and that the supper served on the previous day had not been touched, although his napkin was already tucked in. This is not what the picture depicts, and has led to the conspiracy theories that have since then flourished. The main ones believe that Alekhine either killed himself or was murdered. In his 1975 book Alexander Alekhine Soviet GM Alexander Kotov describes the circumstances of Alekhine's death as follows: "Hopelessly ill, abandoned by all, and rejected by people together with whom he had trodden a great path and who now did not even wish to see him and question him personally, Alekhine was slowly dying in a small room of the hotel Park, half closed for the winter, in Estoril. He had no prospects, no means, and no friends to support him. He either spent the time in bed, or else paced about the room like a lion in a cage. 'One day he phoned me,' writes a friend. 'I have absolutely no money,' said the fading world champion with difficulty. 'I need just a few escudos to buy a cigarette. This loneliness is killing me. I must live, I must feel life around me. I have already worn out the floor-boards in my room. Take me somewhere.'" A Belgian violinist named Neuman, who had lived in the same hotel as Alekhine, had rushed to the room that morning when a waiter told him Alekhine was dead: "You can't go in there said a policeman, barring my way. We are waiting for a forensic specialist. We have to establish that death was from natural causes. What? Yes, you may have a look. I opened the door, the curtains were still drawn and the light was on, although outside it was sunny. On the table were plates, while to the side, on a support for suitcases, was a chess board with the pieces set out. My friend was sitting in an armchair…as though still listening intently to my violin." In 1999 Canadian GM Kevin Spragett voiced the opinion that there was something suspicious about the official version of death by heart attack or choking. "What is wrong with the official story? (I mean, apart from the fact that if a 'normal' person was sitting down and choking he would get up and become quite frantic, possibly even overturning the board and pieces in the process...!?). The doctor who wrote the official death certificate (Dr. Antonio Ferreira, just by chance an avid chess player himself) later told friends that Alekhine's body was found on the street, in front of his hotel room! He had been shot! He said that government pressure had forced him to complete the death certificate as it now exists (Portugal was neutral during the Second World War, and might have wanted to avoid any controversy). According to well placed sources (including Spassky, who is married to a French woman who worked in the diplomatic services) the French Resistance created a super secret 'Death Squad' after the second world war to 'deal' appropriately with those people on a black list who had collaborated too willingly with the German Nazis, once France was overrun by Germany. Apparently the list was not less than 200,000 names! Correspondence of Alekhine, shortly before his untimely demise, mentioned that he felt he was being followed! Alexander Alekhine's initials were AA, so that would put him at the top of any list! Alekhine died within a day or two of the British Chess Federation voting to hold the Botvinnik-Alekhine match... so, if there was an assassin then he had to move quickly since Alekhine was about to go to England!" We have not been able to find independent corroboration of Dr Ferreira's alleged retraction of his original forensic report, but we have located a copy of the original autopsy document, which is not in very good condition. A picture of it was sent to us by Lawrence Totaro of Las Vegas, NV, who owned the document and then sold it to Alekhine Memorabilist, Guy Gignac of Canada. We have retained the size of the original picture as submitted by Totaro, enhancing the contrast slightly to make it more readable. (au)topsy to ascertain the cause of death. (an)d unexpected death could be attributed. I was present at Alexander Alekhine's autopsy which took place in the Department of Legal Medicine, of the Medical School of the University of Lisbon. Alekhine had been found dead in his room in a Estoril hotel under conditions that were regarded as suspicious and indicated the need of an autopsy to ascertain the cause of death. The autopsy revealed that Alekhine's cause of death of [sic] asphyxia due to a piece of meat, obviously part of a meal, which lodged itself in the larynx. There was no evidence whatsoever that foul play had taken place, neither suicide nor homicide. There were no other diseases to which his sudden and unexpected death could be attributed. Antonio J. Ferreira, M.D. After his death Alekhine's body remained unburied in Estoril for a period of three weeks. Then the Portuguese Chess Federation had him interred in a humble sepulchre in the Estoril cemetery. Only a few chess friends were present. His remains were forgotten until 1956, the tenth anniversary of his death, when FIDE, together with the Russian and French Chess Federations, transferred them to Cimetière du Montparnasse, Paris. They placed a red granite monument with his image in Carrara marble at the head of his tomb. The inscription on the grave says: "This monument was erected on March 25 1956 by FIDE, International Chess Federation – Folke Rogard, President Sweden, Viatcheslav Ragosin, Vice President Russia, Marcel Berman Vice President France, Mikhail Botvinnik World Champion USSR, Gian Carlo Dal Verme (Italy) Pierre Dierman (Belgium)"
The text on the tombstone gives March 25 1946 as the day of his death, not March 24. Buried with Alekhine is his fourth wife, whom he married in 1934. Grace Wishart, an English widow, whom he had met when she won a minor chess tournament. She received one of his books as a prize and asked him to sign it. Grace Wishart was 16 years older than her husband and survived him by 20 years. On December 26th 1999 there was a hurricane in Paris, which did considerable damage to the city. Alekhine's grave in Montparnasse Cemetery, where Lev Polugaevsky is also buried. The headstone monument was blown over, shattered and fell on the main gravestone. In the meantime the grave has been repaired and restored to its original state. Pictures of Alekhine's grave by Darren Radford of Chess@Portsmouth. See also Find a Grave for Alexander Alekhine.